Anthony Man writes that a "weekend in Florida for a likely/presumed/unofficial presidential candidate to meet with big-money donors and help other candidates raise cash is usually as routine as a trip to the supermarket. Not so for New Jersey Gov. Chris Christie, who's spending Saturday and Sunday in Orlando, Palm Beach and Fort Lauderdale." 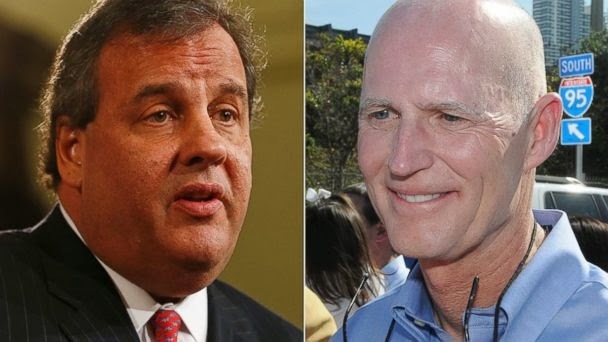 •Christie's visit is now a political headache for Florida's re-election-seeking Gov. Rick Scott. He was supposed to reap publicity and financial benefits from the trip. •The visit is now an opportunity for Democrats. They're deploying U.S. Rep. Debbie Wasserman Schultz of Weston, chairwoman of the Democratic National Committee, to shadow the two men on Saturday in an attempt to put both on the hot seat. Hoping to avoid protesters and television cameras — after national cable-news channels have talked about the trip for days — Republicans have gone to extraordinary lengths to avoid letting people know just where Scott and Christie, the new head of the Republican Governors Association, are holding their fundraising events. Republican insiders, including people who've raised substantial sums for Scott or have served in party leadership spots, said exact details are being kept, in the words of one, "super secret." invitation for Saturday's first event, in Orange County at the Country Club of Orlando, has leaked out. Minimum suggested contribution for the VIP reception is $2,500; the general reception costs $1,000. Neither Fanjul nor Rubin could be reached for comment through messages left at their offices. And Republicans are officially mum, except for this terse statement from Susan Hepworth, the Florida Republican Party's communications director: "We are grateful to have the RGA Chairman in town this weekend to do some events benefiting the RGA and Rick Scott's re-election campaign." Jon Thompson, the governors association press secretary, said none of the events would be open to the public or news coverage. "NJ Gov. Chris Christie in Florida for fundraisers". Aside from playing Hide-the-Christie - and God forbid having the two of them photographed together - Scott's insipid strategy appears to include referring to the big guy from New Jersey as merely the "the RGA Chairman" instead of actually mentioning Christie by name. Christie is apparently that toxic in the minds of Scott's comm folks. One columnist is actually soliciting "Christie sightings? Send pictures and details, please. Email aman@sunsentinel.com, Twitter: @browardpolitics." Did Precourt jump the gun? "State Attorney Jeff Ashton asked Orlando's expressway board Friday to hold off hiring former state Rep. Steve Precourt as its next director because of an investigation his office is conducting of the toll-road agency." "State Attorney: Hold off on hiring Precourt at expressway". Precourt has already resigned from the House, and will be replaced via a primary on March 11 followed by a general election April 8. "After months without a second-in-command, he announced a pick who was well received and on Friday he unveiled his re-election team. He’s criss-crossed the state to tout populist initiatives, like a proposed 10-day, back-to-school sales tax holiday." Republican officials say Scott will have the most expansive campaign in Florida history. He has raised more than $28 million through his “Let’s Get to Work” political committee. Communications director Melissa Sellers is moving from the governor’s office to be campaign manager starting Tuesday. Before she joined the governor’s office in 2012, Sellers was a regional spokeswoman for the Republican National Convention in Tampa and chief spokeswoman for Louisiana Gov. Bobby Jindal. Tim Saler will be deputy campaign manager, and Matt Moon will serve as the campaign communications director. Both are moving over from the Republican Party of Florida. Miguel Fernandez and Darlene Jordan will be co-finance chairs. Fernandez is chairman of MBF Partners, a health care firm based in Coral Gables. Jordan is a former Massachusetts assistant attorney general who was a national finance co-chair for Mitt Romney in 2008. The team will likely come together this weekend as Scott travels the state for a series of fundraisers headlined by Christie. Democrats have promised to hound him every step of the way for associating with the embattled New Jersey governor whose administration is accused of causing a massive traffic jam as political payback. . . .
“We are grateful to have the RGA (Republican Governors Association) Chairman in town this weekend to do some events benefitting the RGA and Rick Scott’s re-election campaign,” said Susan Hepworth, the Republican Party of Florida spokeswoman. "Gov. Rick Scott’s busy week ends with naming re-election campaign team". Note how Ms. Hepworth couldn't bring herself to utter the word "Christie." "The oft-maligned district represented by Democratic Congresswoman Corrine Brown is the target of a federal lawsuit by two voters arguing that it violates the U.S. Constitution. . . . Brown's district has long been controversial. In an effort to give minority voters a voice, it sprawls across eight counties as it winds from Duval County to Orange County, carving out enclaves of black voters to create a district likely to elect a candidate favored by African-Americans. That allows more Republican-friendly seats to be drawn around it." "Lawsuit challenges legality of Corrine Brown district". "Gov. Rick Scott on Friday announced that Eddie Fernandez, a Shutts & Bowen lawyer and past local Young Republicans president, will replace Orange County Clerk of Circuit Court Lydia Gardner, who died last year." "The Puerto Rican-born Fernandez, 33, was considered an early favorite. Scott's interest in a Hispanic candidate for clerk may be part of larger push to build inroads within Orange's burgeoning Latino population." "Scott taps attorney Eddie Fernandez as Orange County's new clerk of court". This appears to be another example of what Miami Herald columnist Fabiola Santiago wrote, with respect to Scott's Lt. Governor pick, of "Rick Scott want[ing] you, Hispanic voter, to forget his anti-immigrant policies, his massive cuts to public education, and his raid of voter rolls in an obsessive hunt for phantom non-citizens." "Think of it as the Florida disease"
Fred Grimm: "The National Institute of Mental Health has identified a malady called 'intermittent explosive disorder,' a condition, NIMH reports, 'marked by episodes of unwarranted anger.'" Add the proliferation of firearms, and IED can turn deadly. Think of it as the Florida disease. “Unwarranted anger” surely describes Monday’s shooting in a Pasco County moviehouse that left a 43-year-old man dead and his wife wounded. Most Americans would categorize a deadly altercation over someone texting during the previews as “unwarranted,” though the shooter might find refuge in Florida’s famously permissive self-defense laws. It was the utter banality of the dispute that held the country’s attention through a day’s news cycle (until a 12-year-old shot two fellow students at a Roswell, New Mexico, middle school on Tuesday). In a nation that records 30 gun-related murders a day (along with 162 gun maimings and 53 firearm suicides), the killing at the Wesley Chapel cinemaplex grabbed the collective imagination, because it added to the sense that in our gun-toting society, any damn idiot squabble could lead to homicide. . . . According to NIMH, IED (excluding cases of bi-polar disorder and antisocial or borderline personality disorders) affects some 7.3 percent of adults. It seems as if we have more than our share in Florida. . . .
We’ve seen road-rage shootings. We’ve had angry drunks ejected from bars and coming back blazing. And more angry shootings are on their way: Just last week, the state’s gunslingers filed a lawsuit to force the University of Florida to allow students to keep guns in their dorm rooms. That’s something worth pondering for the parents of Florida’s college kids, mindful that, nowadays, "intermittent explosive disorder" often comes locked and loaded. "Fred Grimm: Florida has too much 'intermittent explosive disorder'". "Scott wants to expand back-to-school sales tax holiday". "A few hundred teachers marched down Biscayne Boulevard to protest high-stakes testing and education policies they believe damage public education." "Miami-Dade teachers march on Biscayne to protest Rick Scott’s education policies". Notice how the writer of this Miami Herald piece carefully inserts the word "few", as opposed to leaving it at "hundreds of teachers". Just sayin'. Newspapers are, after all just businesses out to make a profit; and with that comes a distinct political agenda, and that is especially true of the Miami Herald. "In Florida, it's practically impossible to escape one's poor decision thanks to dozens of websites that exist to repost mugshots and charge offenders to take them down. The effect of this cottage industry on vulnerable offenders is well-documented, and it can cost thousands of dollars to clear one's Google search results after being charged with a crime." But all that might be about to change. Late last year, the New York Times reported that Google, Mastercard, Discover, American Express and PayPal wished to sever their ties with the industry. The latest blow came last Friday, when a Tampa judge found that the republishing of mugshots for profit is in violation of a state statute. "Could Florida's Mugshot Industry Be Coming to an End?" Fabiola Santiago writes that "Gov. Rick Scott wants you, Hispanic voter, to forget his anti-immigrant policies, his massive cuts to public education, and his raid of voter rolls in an obsessive hunt for phantom non-citizens." Never mind his lack of support for undocumented college students who pay outrageously higher tuition fees, can’t get a driver’s license, and have staged sit-ins in Tallahassee to get his attention — with no response. Or the curtailed voting hours that disproportionally affected Hispanic and African-American voters. Or his refusal of federal funds for transportation and Medicaid. You’ll forgive the last three years of his administration, the tea party governor thinks, because he has put a Hispanic name on his reelection ticket. After keeping the job empty for 10 months, Scott announced this week that his lieutenant governor will be Carlos López-Cantera, a former Cuban-American legislator from Miami and now Miami-Dade’s property appraiser. It’ll be a historic first for the state when he’s sworn in on Feb. 3. And oh, yes, Scott had lunch Thursday at La Carreta! All the love is only a bid to boost Scott’s appeal among the state’s growing Hispanic voters and the largely ignored urban dwellers of South Florida adversely affected by Scott’s policies. All the love is only a campaign strategy to fix the image of an uncommunicative and unpopular governor facing reelection and low poll numbers. Too little, too late. . . .
He’s hoping that seeing López-Cantera’s good name on the ballot will automatically give the governor’s record a pass. "New appointment doesn’t mean Scott can count on Hispanic vote". Crisafulli questions Senate water proposals . . . but where will he be on tax cuts? "The Republican majority leader and House speaker-designate in 2015 says he's been given a lot of latitude by House Speaker Will Weatherford to work on water issues. He questioned a Senate proposal to spend $378 million a year on springs and another to spend another $220 million to benefit Lake Okeechobee, Indian River Lagoon and the Everglades. 'We don't have that type of money to put into those types of projects,' he said." "Crisafulli questions Senate water proposals, says House working on own bills". "Special Election Darling Sinks to Top"
"In a tossup district in a tossup state, Democratic darling Alex Sink has a lot going her way: national media attention, in-state name recognition and a fat pile of cash. David Jolly, her newly crowned GOP opponent, has none of the above." "Florida's Special Election Darling Sinks to Top With Out-of-District Cash". The Sunshine State News: "Democrats and liberals made an effort in the latter half of this week against incoming Lt. Gov. Carlos Lopez-Cantera, hitting Gov. Rick Scott’s new understudy on a host of fronts -- but they could be undermining the candidate they plan to run against Scott." The Florida Democratic Party took aim at Lopez-Cantera on Thursday for his “ultra-conservative record” in Tallahassee, slamming the new lieutenant governor for backing cuts to the education budget, supporting energy exploration including drilling in the Gulf in 2009, backing mandatory ultrasounds for women considering having an abortion and backing “big taxpayer handouts to some of Florida’s biggest corporations” back in 2007. In their attacks on Lopez-Cantera, the Florida Democrats could also be hitting the front-runner for their gubernatorial nomination. Former Gov. Charlie Crist, then a Republican, served as governor in 2007 and backed the budget and incentive programs the Florida Democrats are now hitting Lopez-Cantera for backing. While he opposed drilling in the Gulf after the 2010 oil spill and after leaving the GOP to continue his U.S. Senate bid with no party affiliation, Crist supported drilling back in 2009 -- the same time the Florida Democratic Party called out Lopez-Cantera on. "Florida Dems Hit Carlos Lopez-Cantera for Sharing Charlie Crist's Positions". "Barbara Bush on Jeb running for president: 'I hope he won't". "The two Democratic candidates for state attorney general, George Sheldon and Perry Thurston, agreed on almost every issue in a Tampa appearance Friday and said their contest would be settled on the question of who’s most likely to beat Pam Bondi." In a joint appearance at the Tiger Bay Club of Tampa, there were hints one or both might consider dropping out of the race to leave the field clear for the other to challenge Bondi, the Republican incumbent. Asked whether they’d be willing to end their candidacy, neither said yes, but neither firmly denied it. "Dems focus on besting Bondi". "Miami Beach leaders reject legal action to fix yacht woes". A former Montana judge who was being investigated for forwarding a racist email involving President Barack Obama sent hundreds of other inappropriate messages from his federal email account, according to the findings of a judicial review panel released Friday. "Federal judge sent hundreds of bigoted emails". Cebull was nominated by former President George W. Bush and received his commission in 2001. "Social and tax issues on the ballot increase turnout"
Aaron Deslatte: "Orlando trial lawyer John Morgan — Crist's employer — says he has invested $2.8 million in the marijuana drive to help end the hypocrisy of people forced to seek it illegally to ease their pain. The Florida Chamber of Commerce and other groups backing incumbent Republican Gov. Rick Scott call the initiative a smoke screen to gin up voters for Crist." Political-science researchers for years have found evidence social and tax issues on the ballot increase turnout, although the effect is often marginal and varies by issue. Even the act of gathering more than 1 million signatures for the drive can have a mobilization effect on "irregular" voters when the question reaches the ballot, according to one 2012 study in the journal Political Behavior by researchers at the University of Arkansas and University of Florida. "It certainly should have a mobilizing effect. It very well might be marginal, but in a close election it could be determinative," said UF political scientist Daniel Smith, one of the co-authors. "Medical-marijuana fight sparks serious health debate".